Hello friends! 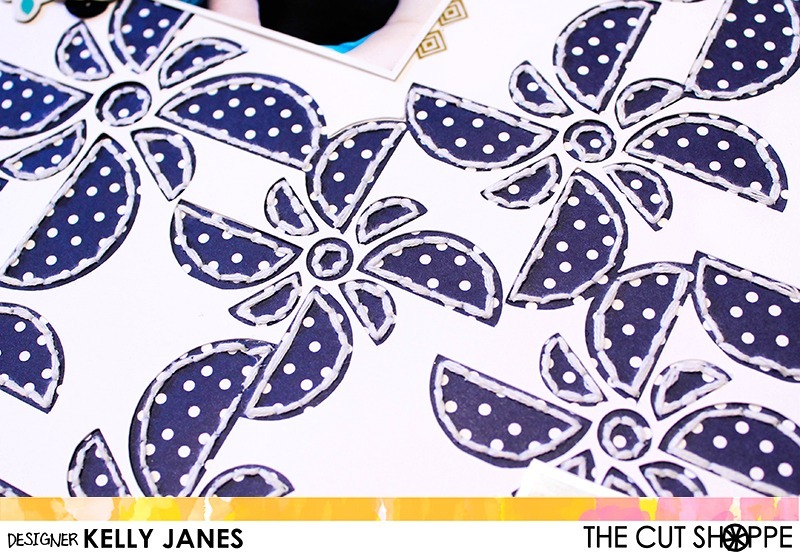 I have another scrapbook layout for The Cut Shoppe today using the Spinwheels Cut File. I started by slicing out an individual “spinwheel” in Cricut Design Space. Once I had the “spinwheel” separated from the original cut file I resized the image multiple times and welded the “spinwheels” together to create this diagonal design. Once it was cut I backed the white cardstock with a sheet of pattern paper from the Amy Tangerine-Better Together Collection. I wanted to add a little more detail so I hand stitched around each image using white embroidery floss. I couldn’t decide if I wanted to use black and white photos or use them in color so I printed them both ways. I decided to offset the colored photo with the black and white photo for added interest. I also placed a clear overlay from the Amy Tangerine Better Together Collection on top of both of the B&W photos. These photos were taken last year as part of our family photo session by my sister who is a very talented photographer in the Fort Wayne, IN area. Andy and I haven’t had photos taken of just the two of us since our wedding nearly 11 years ago. I especially love the one of me laughing. That photo captures who we are when we are together. I love that…when a photo invokes emotion! He truly is my better half and I am so grateful to have these photos!! 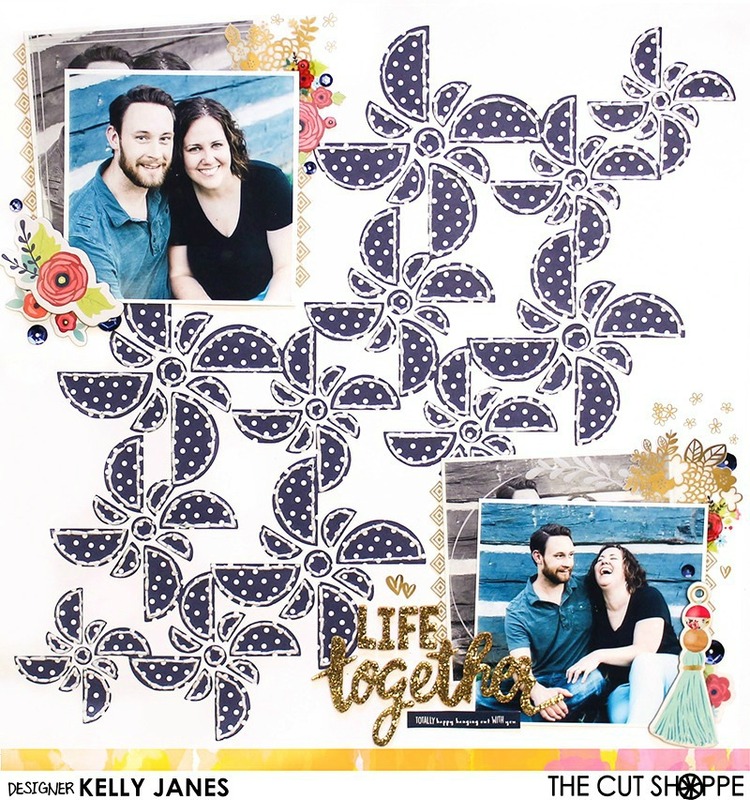 Once I had the photos positioned I started arranging clusters of embellishments around the photo, including items from the Shimelle Starshine Collection, Maggie Holmes-Bloom Collection, Amy Tangerine rub-ons from Better Together, and blue sequins from Jillibean Soup. 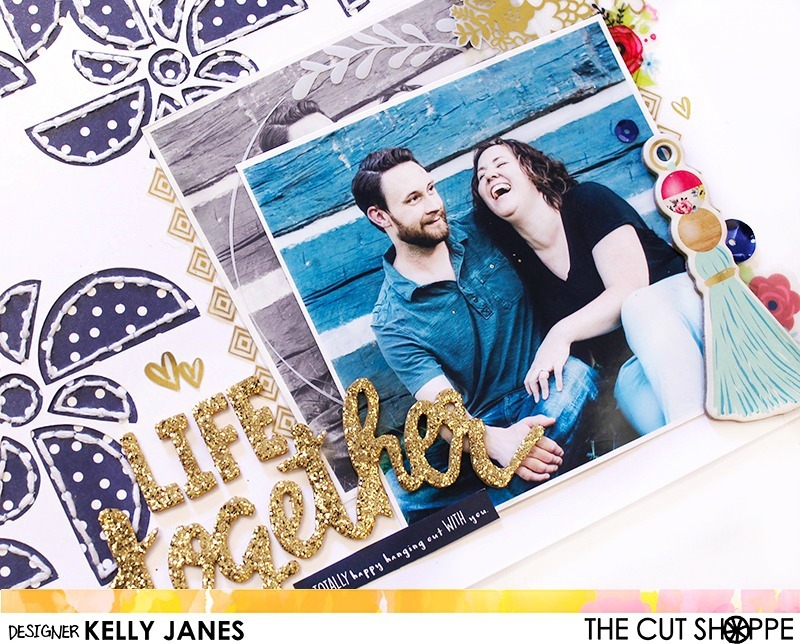 This layout was so much fun to make and I have a process video showing you how it all came together!